Mike Ghouse March 27, 2019 March 27, 2019 Comments Off on Am I a Hindu, Muslim, Christian or a Jew? Ananthram Singh Rathore Jodhpur Ananth, religion is merely an identity, like race, ethnicity or nationality. The creator does not have a specific personality, he belongs to the entire universe. The ideal goal of religion is to make each one of us God-like, that is treating all his creation justly and equally with no privileges to one over the other, or make a deal with one group behind other’s back. What each religion aims to accomplish is to make a responsible citizen out of an individual. If that person wears a blue, white, beige, yellow or purple shirt, the man/woman is still the man/woman. No color is superior to the other, and each one is different and unique. Deva P Ramsaroop was president of the DFW Hindu Temple, and he was considering honoring me with a title of Honorary Hindu. Maybe because on my Radio show and in the Newspaper, there were more Hindu events and Hindu items than other faiths. Damini Singh joined me for nearly seven years on and off to talk about the essence of Hindu Festivals. Many a Muslims thought I was a Hindu to the point that the Imam Zia Kavakci was told not to perform the wedding for me with my late wife, Najma. Of course, he was on my show too, and he appreciated my conversation and did officiate the wedding. Najma was a gem, and she did not have any bias towards anyone either. We both volunteered in all places of worship including the Hindu Temple. On my daily Radio show called Wisdom of religion, all the beautiful religions, the Buddhists and Bahai friends Kevin Rafaf won’t be able to make it to the show on occasion. I ended up talking about both the faiths, and I am reasonably well versed in the essence of both religions. My late wife’s friends thought I was a Buddhist, and my Christian friends thought I was a Bahai, because of my inclusive language. Many of my Hindu friends thought I was a Malayalee Christian. One rare human called me a Sikh because I am a good friend with Dr. Harbans Lal, I had organized a big event on the Sikh Massacre (we have covered all Genocides and Holocaust events in our annual program), and had them involved in many of our programs. I attended an LGBT rally in Addison Airport hangar, all the men and women there thought I was gay. One Indian gay fellow was hiding behind others, so I don’t see him. I walked up to him and said, it is ok if you are gay, and I will not tell anyone about it. Moreover, I am not gay, and I am here to stand with the LGBTQ community. I have also walked in many LGBT rallies in Dallas. I hope someday; someone will call me a Zoroastrian, Dalit or Jain if they google Zoroastrian, Jain or Dalit with my name, they may think I am one of them. Dr. Poras Balsara, Nina Kalian, Dr. Pradeep Shah, Kirit Daftary were diligent on sharing about their faiths without fail. Those are the only labels I have not earned yet. God will bestow that opportunity someday. I consider myself a part of the Universe, as Islam calls it Aalameen. Islam has nurtured me to be a universal pluralist, that is a creature affiliated with the entire universe with no barriers. The Islam I know and have boldly written about it in the book American Muslim Agenda is inclusive, all-embracing. 90% of American Muslims would agree with the articulation in the book, and the book will become a reference and a teaching manual for Islam to Muslims and non-Muslims alike. Someone pointed to me after I wrote the following sentence that Mahatma Gandhi had said this, “ A good Hindu is a good Muslim is a good Christian is a good Jew is a good Sikh. If you are serious about finding out what percent of you are a Hindu, Muslim, Christian, Jew, Sikh, Jain, Atheist, Wicca, Shinto or the other, go to Beliefnet. 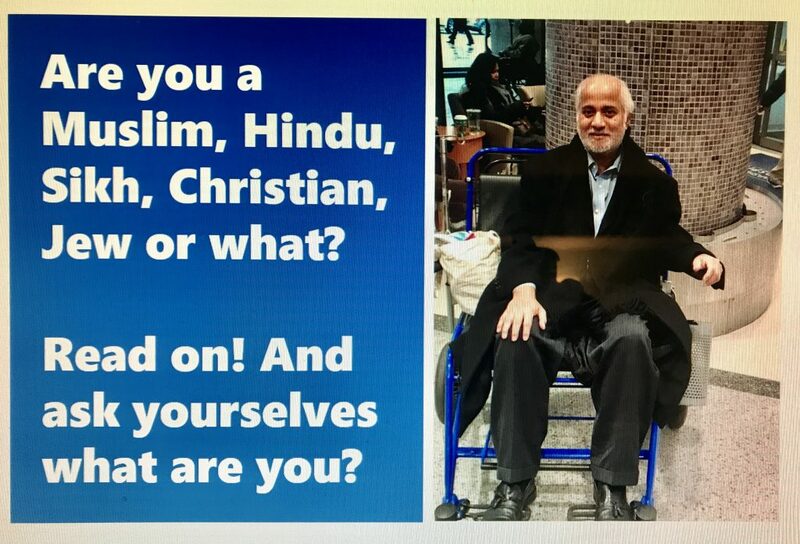 net and take a quiz, you will answer about 100 questions there, and based on your answer, the results will pop out that – you may be x% Muslim, y% Hindu, z% Reformed Jew…… each one of us is at least 50% of the other.